Aspen Associates ensures that our clients get what they need most: effective risk management that can reduce their liability and costs. With our wide knowledge of building and countless hours spent on job sites, we are uniquely positioned to provide entire project oversight or selected services. Aspen will serve in either capacity as an Owner’s Representative or Construction Manager pending the owners level of involvement. In either scenario, we review plans for value-engineering opportunities, perform cost-benefit analyses and best-value comparisons to find as many ways as possible to save costs while offering a myriad of other services to ease the Owner’s administrative burdens and increase the value of the construction process. 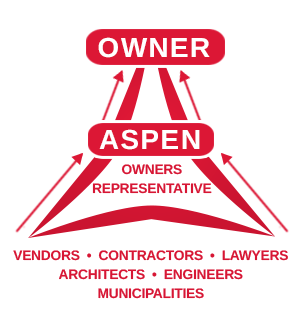 Whatever the challenge to the Owner, Aspen Associates is there to help meet it, as efficiently and cost effectively as possible. Contact us today to learn more about the scope of our services or to schedule a consultation.